Two more champions were awarded bracelets on Day 4 of the PokerStars World Championship of Online Poker, and one Team PokerStars member fell just short of claiming his first. Canadian Pat Pezzin attempted to become the first PokerStars pro to win an event in the 2011 series, but his bid was squashed by Romanian poker pro Andrei "extasyman" One in the $1,000 Two-Day No-Limit Hold’em event. The other bracelet went to Finland's Olkku in the $250 PLO Knockout event. Day 2 of the $1,000 No-Limit Hold’em Event #9 resumed with 65 of the original 1,237 entrants competing for a $216,227 first-place prize. Team PokerStars Pro Pat Pezzin headlined a talented field Wednesday and wasted no time moving his chips. He doubled his stack early and continued building all the way to the final table, where he began second in chips to Andrei "extasyman" One. What a cooler. The flopped boat of "dadowiec" was out in front, but the on the turn left him drawing to one out because his opponent's hand improved to a better full house. The on the river changed nothing and "G3RALDD" doubled to 1.27 million in chips. "Dadowiec" was left with just over 400,000 and was eliminated in ninth place a few hands later when his lost to "extasyman's" . After Erika "Eri264" Moutinho and Dean "dean23price" Price exited in eighth and seventh place, respectively, "G3RALDD" was eliminated in brutal fashion in sixth. With the blinds at 17,500/35,000, "G3RALDD" raised to 72,500 from under the gun and "Shafeman" three-bet to 172,875 from middle position. "G3RALDD" put in a four-bet to 350,500, and "Shafeman" moved all-in, putting the 1.3 million chip stack of "G3RALDD" at risk. It was kings versus queens, with "G3RALDD" ahead, but the board ran out to send the Dutchman to the rail with $49,480. "Shafeman" took the chip lead with over 3.5 million. Pezzin then got involved, eliminating a short-stacked "mitdadu" in fifth place when his outran his opponent's pocket jacks. Then, after "777taxist777" bowed out in fourth place, Pezzin made his exit in third. "Extasyman" opened from the button with a min-raise to 100,000 with and Pezzin moved all-in from the big blind with . "Extasyman" called and Pezzin's fate was sealed with the board. He collected $117,515 for his efforts. That left "extasyman" and "Shafeman" to battle it out for a $216,000 first-place prize, nearly $60,000 more than second place. "Extasyman" began with a 2-to-1 chip advantage, but that changed with "Shafeman" winning a preflop confrontation with against a pair of threes. That evened things out momentarily, but "extasyman" chipped away at the Costa Rica native over the next 27 hands before finally claiming victory. On the final hand of the match, "extasyman" opened the button with a min-raise to 100,000 and "Shafeman" called to see a flop of . "Shafeman" checked, "extasyman" fired 125,000, and "Shafeman" put in a check-raise to 298,555. "Extasyman" didn't back down; he raised again, this time to 785,700, and then called the all-in bet of "Shafeman" for 3.17 million. "Extasyman" tabled for a pair of threes and was virtually flipping against the of his opponent. The turn and river brought no help to "Shafeman," and Andrei "extasyman" One earned his first WCOOP bracelet. For the second straight day, Peter "Iteopepe88" Gelencser made a deep WCOOP run. On Day 3, he came up just short of making the WCOOP 8 final table, finishing in 15th place. It was a different story on Day 4, though, because Gelencser brought a healthy stack to the final table of Event 10, the $250 Pot-Limit Omaha Knockout. With 14 players left, he captured the chip lead when he eliminated Jon “LUFCBas” Spinks. The chips went in after a flop and Gelencser held for top-two pair. Spinks tabled top pair and a flush draw, but found no help from the turn and river to hit the rail. It wasn't long before short-stack "amberland10" succumbed to a ninth-place finish. After calling all-in for less than two big blinds against three other players, "amberland10" could not best "Olkku's" when the final board read . On the next hand, "Olkku" doubled through Peter Gelencser to capture the chip lead. All-in following an flop, "Olkku" tabled for an open-ended straight draw, as well as the nut-flush draw. Gelencser showed for the same open-ended straight, an inferior flush draw, but for the moment a pair of sevens. When the hit the turn, "Olkku" locked up the pot with nut flush to cross the 2,000,000 chip mark, while Gelencser and the rest of the table were each under the 1 million mark. "Olkku" wasn't going to sit back, immediately putting his stack to use and eliminating "vivhost" in eighth place. After "Olkku" opened with a raise under the gun, "vivhost" shoved from the next seat over. Action folded back around to "Olkku" who called with . Facing "vivhost's" , "Olkku" got there on the river when the board came down . That still wasn't enough for "Olkku" who eliminated second-in-chips "Sutyi71" shortly thereafter. After calling "Sutyi71's" three-bet preflop, the flop fell . "Olkku" bet enough to cover "Sutyi71's" stack and sure enough, it was another all-in and a call. "Sutyi71" trailed with , having been outflopped by "Olkku's" . The turn improved "Olkku" to a ten-high straight to score a third straight elimination. With less than three big blinds, "tram-vai" shoved with and led the of Peter Gelencser who called from the big blind. The board ran out , giving Gelencser a set of threes to win the pot. The next to fall was "mayday80," getting it in on an board with for top two pair and a straight draw. "Totti500" flopped a straight with and held through the turn and river. The next hand was Peter Gelencser's last. Although he was all-in after the flop, Gelencser committed his stack preflop with against the of "Olkku." The board ran out and once again, "Olkku" spiked a straight on the river to score the knockout. "Totti500" exited in third place after flopping middle set on a board. With , "Totti500" was all-in against "Olkku's" . Be it the flush draw or straight draw, it seemed like destiny for "Olkku" to get there again. Sure enough, the hit the turn to give "Olkku" a flush. The board did not pair on the river, ending "Totti500's" tournament. The chip counts to start heads-up play were 5,530,992 for "Olkku" and 824,008 for "kysah." Although "kysah" did mount a comeback and take the lead briefly, it was not enough. In a limped pot that produced an flop, the two went back and forth with a few raises, leading to "kysah" being all-in with . "Kysah's" top two pair needed help because "Olkku" showed down for bottom set. The turn and river locked it up for "Olkku," giving him a WCOOP bracelet and $43,214. Event #11 on the WCOOP slate was scheduled as a two-day event, but the no-limit hold’em ante-up tournament probably could have finished in a single sitting because the action flew by furiously on Wednesday. The starting field of 1,467 was trimmed down to 12 after 33 20-minute levels, but play was halted just before the final table. Several Team PokerStars Pros made deep runs in the event, including Johnny Lodden, Daniel "KidPoker" Negreanu, Kevin "WizardOfAhhs" Thurman, Henrique "Henrique P." Pinho, Vicky Coren, Humberto Brenes, and Bertrand "ElkY" Grospellier, all of whom cashed in the event. Grospellier had the best result with a 30th place finish and was eliminated when he moved his short stack in with , which couldn't improve against the of "ricestud." James "Andy McLEOD" Obst survived Day 1 sitting fourth in chips with 822,205, and the former WCOOP bracelet winner has a chance to make history if he can reach the final table. The young Australian pro is currently tied with Grospellier and Steve "Rabscuttle" Cowley for the all-time lead in WCOOP final tables with six. With a victory, he can tie Grospellier and eight others with two WCOOP titles; Ryan “g0lfa” D'Angelo is the all-time leader with three. 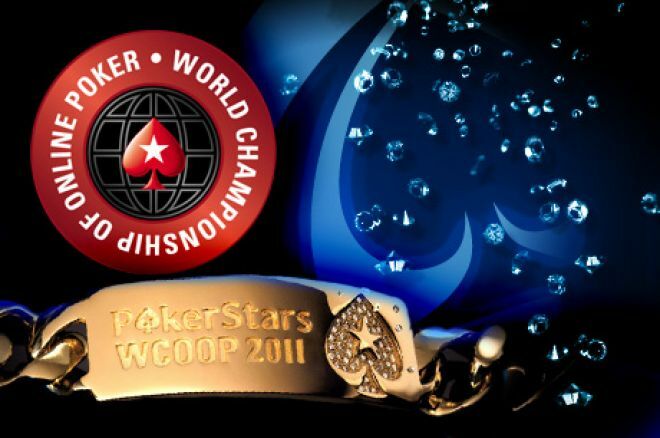 The first heads-up event of the WCOOP drew 2,224 and after six rounds, only 64 will be returning to duke it out for the WCOOP bracelet on Day 2. Among those returning are Michael "wywrotX" Wywrot, Thierry "BOKPOWER" van den Berg and Team PokerStars Pro Martin "AABenjaminAA" Hruby,, each with their eyes set on the $75,616 first-place prize. We will be providing in-depth daily recaps of all WCOOP final tables, so be sure to keep it here at PokerNews to stay up to date on all of the exciting action as it occurs. For news, updates, and more, follow PokerNews on Twitter and Facebook.